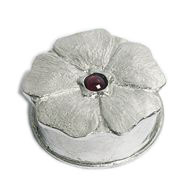 This beautiful keepsake or pill box is shaped like a forget me not flower, and set with a real amethyst. Handmade in England from lead free pewter, this box will not tarnish and will gives years of enjoyment. It would make a perfect Christening gift for a little girl or a handmade bridesmaid's gift. Why not fill it with some jewellery or another small treasure? 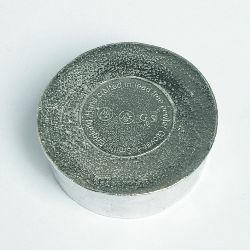 This box measures approx 5cm diameter by 2cm high (including the lid) and is stamped with the worshipful company of pewterers mark and the makers marks on the bottom and also the words "Handcrafted in lead free pewter England".